It’s a risk management decision most employers and insurance professionals will have to make at some point – take your chances at trial or do everything you can to settle your case? This unique mock trial program, which was based on an actual sexual harassment and retaliation case, provided attendees with an opportunity to learn about the inner workings of a trial and pulled back the curtain so participants could watch and listen as a jury deliberated before returning its verdict. Featuring some of Plunkett Cooney’s leading trial attorneys, this program covered elements that sparked the #MeToo movement and trial tactics like the “Reptile Theory,” which plays on the emotions and most primitive parts of a juror’s brain to position the plaintiff’s case for success. Did our employer defendant come up snake eyes after rolling the dice during our mock trial or did the jury see through the plaintiff’s efforts to distort, manipulate and obfuscate the facts and grant a favorable defense verdict? Following the mock trial, our attorneys discussed post trial options employers can pursue on appeal should a jury render an adverse verdict. The program concluded with an update on significant Michigan employment law cases. 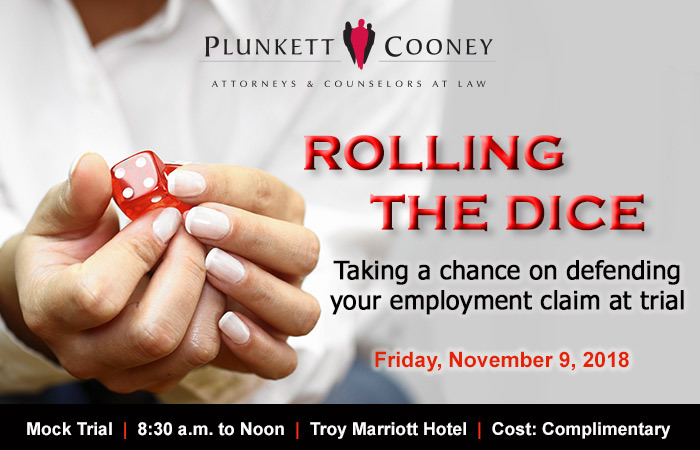 “Rolling the Dice” was designed to benefit human resources professionals, business owners and executives, insurance professionals, in-house counsel and risk managers. This activity was approved by the HR Certification Institute for 3.5 (general) recertification credits toward the aPHR®, PHR®, PHRca®, SPHR®, GPHR®, PHRi® and SPHRi® certifications. The use of this seal confirms that this activity has met HR Certification Institute’s® (HRCI®) criteria for recertification credit pre-approval. This seal may be used exclusively for activities that have been pre-approved by HRCI. This approval is valid through 11/9/2018 and is not transferable. Plunkett Cooney is recognized by SHRM to offer Professional Development Credits (PDCs) for the SHRM-CPSM or SHRM-SCPSM. This program was valid for 3.5 PDCs for the SHRM-CPSM or SHRM-SCPSM.For more information about certification or recertification, please visit www.shrmcertification.org.